Piano performance? Seriously? I never intended to become a pianist! I honestly was not even aware of that term. As I explained, in my home page, I have been designing cities since my childhood. My designs were still primitive, but I was very serious about my life goal. My mother on the other hand, being a lover of piano performance since her childhood, found a piano teacher who started giving me private lessons by age nine: having to count only on my father's modest income, she was extremely careful as to not rush into buying a piano, until she was absolutely certain that I was talented enough. After the first year of private lessons, my teacher insisted that I participate at the entrance examination of the State Conservatory of Thessaloniki (the only State Conservatory of Greece, by the way) so that I would receive a more formal piano performance education. And so it happened: I entered the class of piano at age ten and, within ten years I advanced to the final examinations for the Soloist Diploma. I did not mind receiving piano lessons, but I was definitely not particularly drawn to piano performance (at least, not initially! ): I attended the music classes (which were a heavy load of daily hours in attendance alone) with the same duty-like attitude as the one I reserved for other school classes. Despite the fact that I was literally jumping ahead of my classmates, I found piano lessons to be just another boring assignment: maybe the fact that my piano teacher insisted so much on my studying endless (in my adolescent mind: stupid) "Etudes" and works by Chopin, Mozart, and Haydn (I disliked these composers right away and have not changed my mind since then!) was a turn-off for me. Little did she suspected that, behind the mask of the serious/quiet 'well behaved' young girl, a turbulent temperament was just broiling! The latter was to be discovered by another piano teacher I had, the brilliant Hungarian pianist Gellert Modos. During my adolescent years, I started putting the plan of my architecture studies into action by following the praktikum (emphasis in mathematics) section of the high school/college I was attending (the American College "Anatolia" of Thessaloniki). My father, being strong in these subjects, had been preparing for me entire dossiers with specific exercises-tests in algebra, trigonometry, and physics: entrance in the Greek universities was granted only after succeeding at the very strict Panhellenic examinations. At the age of 15, I was called to replace the graduating piano accompanist of the Anatolia College choir: quite a demanding task. I was not particularly happy with this situation, as I preferred to sing in the choir. Still, and despite these new duties, my piano interest remained the same: pretty much "flat". Then, suddenly, an unexpected event happened: Anatolia had extra-curriculum daily activities (usually after lunch times) that covered a broad spectrum of interests (from various sports, to archeology, literature, math, music, theater, and painting). During the first 2 years I had participated in the painting classes: one my two teachers, George Moschos, was particularly successful in bringing out some of my abilities in painting. I still consider my very first 2 oil paintings (done under his supervision) as some of my best. As I started my new "position" (as an accompanist of the Anatolia College choir), I also joined the music club. This was what we would now call a "music appreciation" club: we had the chance to listen to the very best works of Classical music. Yet, the turning point in my career came unexpectedly on a specific afternoon: we were gathered in the large 500-seat music hall, and I had picked up my favorite seat way at the back, alone! Then as our music teacher chose the composition of the day, I was really not prepared for what followed next: an incredibly dramatic music filled the hall and I started to shiver, tremble and finally to cry. Embarrassed by the last reaction (I never allowed myself to cry, let alone in front of others), I hid my head inside my arms,lowered my body within the seat, and hoped to...escape notice. However, I was not that lucky. A young student saw the change and alerted the teacher. Even more embarrassment followed! 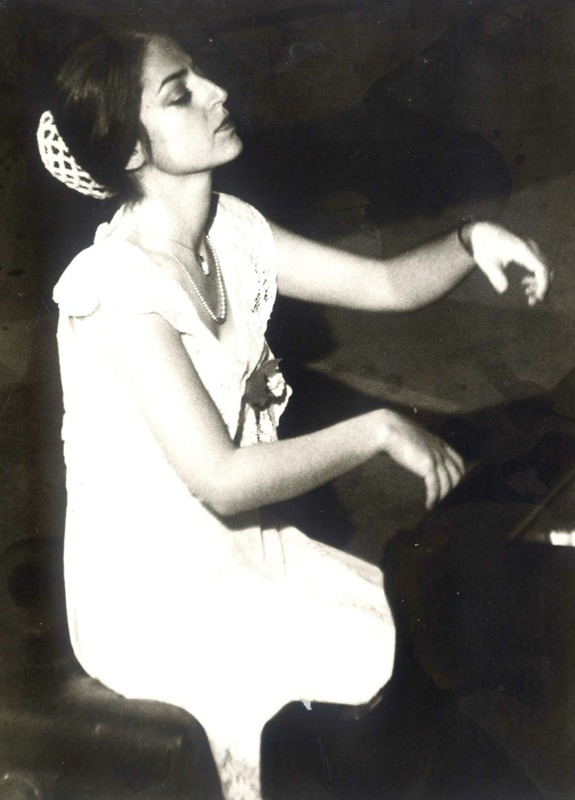 The composition that change the course of my professional life was Khachaturian's 2nd symphony (the part of the solo piccolo flute seemed to tear me apart).Thus, young Katerina (at age 15) changed her original plan of studying architecture into studying piano performance. Years later, when I made my debut with the State Orchestra of Thessaloniki, the ONLY choice was for me the Khachaturian piano concerto! I cannot say that I have been a "protege": nothing like that. I was definitely very gifted (mostly in a "musical sense"), but I had to work very hard to acquire the technical skills needed for this career. I must admit that I was extremely lucky in one thing: I had very strict and demanding piano professors. I have studied with Gellert Modos for only one year (he was preparing for his departure/immigration to the United States at that time): he prepared me for the Panhellenic Piano Contest and my Piano Diploma. As he put it, there was not enough time to teach me solid technique, but there was enough time to form me as a solid musician. He used to give me a 2-hour lesson per week at the Conservatory, and another two 3-hour lessons/week privately for which he never accepted any compensation! At the Pireus Conservatory they remembered me for years as the "only student who Modos accepted to prepare for a piano diploma"! At that time, I was considering to study piano in Paris (was learning French already). Modos changed my decision. To him there was only ONE city in Europe where one could learn "real" music and this city was Vienna. So, quickly, I had now to learn...German and prepare for my entrance exams in piano performance there. He did NOT advise me for the Musikhochschule but, instead, for the Conservatory where the "best" (according to him) piano teacher was teaching: Dianko Iliew. Iliew was a student of Annie Fischer, one of the most remarkable piano performers. I got lucky again: Iliew accepted me in his class and then, the big fun...started! Nine years of intense and profound training: a training that could get ruthlessly strict, if needed. And then, by age 34, an offer from Kent State University (Ohio) came to complete my Masters studies there. So I did. And returned to Greece. Several years passed and I grew restless (one of my main characteristics!). So this time, and knowing the procedures, I applied to 13 Universities in the USA for my Doctoral studies in piano performance (DMA). As I was told, times "had changed" and financial assistance was not so easy to get. Anyhow, and never doubting that I could reach my goal, I applied. I received two very generous offers. Both were fellowships: from The University of Denton (Texas) and from The University of Iowa. The American Center of Thessaloniki advised me to accept the Iowa offer: the place was described to me as a "cultural paradise in the midst of corn fields"! And so it proved to be. I have adored my study years at The University of Iowa: by the time I entered as a doctoral student in piano I was 46. It was fun to be like friends/colleagues with faculty members and also extremely refreshing to go back to school and allow myself to be one among other students. Nothing can be more rejuvenating (at least to me) than to study at a later age. And work 12 hrs/day like crazy! Oh, yes, I forgot: by entering the piano section I decided I wanted to study composition as well. After receiving permission, I followed a double-study course of work towards a DMA in piano performance and a Masters in composition. This decision was to change my life for good. Several years later, and after stopping my DMA studies for health reasons, I returned to the University of Iowa again: this time with a scholarship/assistanship to complete my PhD studies in composition! I will be forever grateful to the piano faculty of the school of music-and especially to Uriel Tsachor, my piano professor: his ongoing understanding throughout the period of my transfer from the department of piano to the department of composition, helped me grow artistically in the most unique way. One of my happiest memories is the academic research done under the supervision of some great faculty. You may want to indulge into a particular paper, written at Kent State University, which refers to the development of the modern piano. On a separate web page, I will post a complete list of the piano repertoire I have studied and performed in public.